1. Our smart sockets are equipped with upgraded WiFi modules, it guarantees more stable connection. 2. 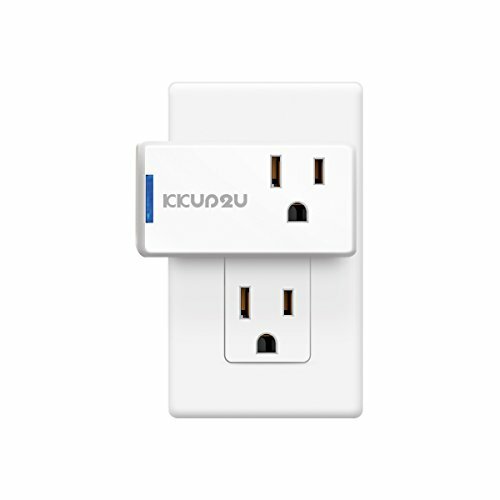 You can easily stack two smart plugs in one outlet, no more concern about outlets shortage. 3. The shell is made of imported Flame Retardant PC materials with excellent impact resistance and heat resistance. It cuts off your devices when necessary, protecting your appliances from burning or short-circuit. 4. We offer 30-Day Money Back, 24-Month Warranty and Lifetime Support. For any problems with our smart plugs, please feel free to contact us, we'll try to give you the best solution, your 100% satisfaction is always our goal. * Download at APP store to install Jinvoo or Smart Life app for iOS or Android. * After installation, the app will ask you to create an account. Select your country and enter your phone number or email address to register. * Enter the verification code if you register by phone number, then create a password. * Make sure the light on smart plug is flashing 2 times per second in blue the first time you plug it in your outlet. If not, please press the power button for 6-8 seconds to reset. * Open app and click "+" to add a device like Electrical outlet. * Confirm indicator rapidly blink and input Wi-Fi password.